Between 1933 and 1939, the strength and influence of the SS grew considerably with thousands of men being recruited into the new idealogical armed formation. Many into units know as the SS Verfgungstruppe (Special Disposal Troop). These troops saw action in Poland before switching to the Western Front in 1940. Out of this organization the SS Das Reich Division was created. 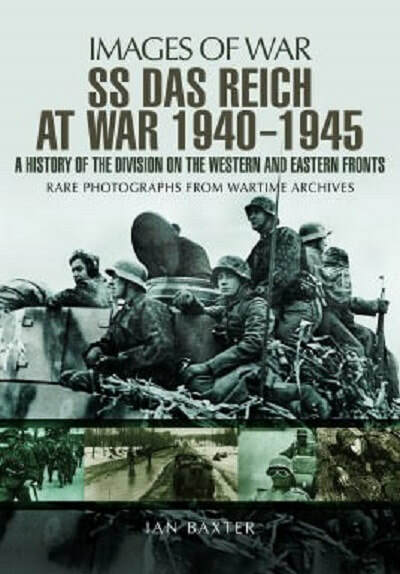 This book with its extensive text and 203 rare and unpublished photographs with detailed captions describes the fighting tactic, the uniforms, the battles and the different elements that went into making the Das Reich Division such a formidable fighting force. The chapters reveal the Division as it battled its way through Poland, the Low Countries, the Balkans and the Eastern Front. Finally, the Das Reich defended Normandy before falling back into Germany. The Division gained its fearsome and notorious reputation for its fighting ablility, often against vasily numerically superior forces, as well as its fanatical zeal. Ian Baxter is an avid collector of WWII photographs. His previous books in this series include "Hitler's Boy Soldiers", "Nazi Concentration Camp Commandants" and "German Army on the Eastern Front". "The Advance, German Army on the Eastern Front", "The Retreat", "The Crushing of Army Group (North)" and SS Leibstandarte Division at War". He lives in Chelmsford, Essex, UK. Pen & Sword Publications is based in the UK. This book is soft-cover of 144 pages in 9 3/4" x 7 1/2" page format. The cover art shows a large black and white photo of SS Das Reich troops sitting atop a Pz.Kpfw. IV, over 3 more black and white photos showing then marching down a road, riding motorcycles and planting a mine and a illustration of the Division's shield. The 3 black and white photos on the back cover show them near railroad tracks, using a flamethrower and being ordered by an officer. All photos in the book are in black and white. Early in the book is 10 photos of the troops on parade and 5 photos of troops manning guard shacks. 3 shots of graveyards, 3 shots of troops loading a railcar, 2 shots of troops with dogs, 2 shots of troops eating, a shot of troops gathering sheep, 2 shots of troops manning radios, 3 shots of troops on sleds in snow, 2 shots of Pz.Kpfw. III's, a shot of troops unloading mail sacks off a truck, a shot of troops atop a Tiger tank, 3 shots of wounded troops, 4 shots of Pz.Kpfw. IV's, troops with a Sturmgeschutz tank, 5 shots of troops with a niebelwerfer and a shot of a soldier planting a mine. This is one great picture album. Highly recommended to modelers and historians alike. I want to thank Casemate Publishing, who sent me this sample book. They are the North American Distributor for Pen & Sword books.